Mrs. on the Move : What's in my bag? 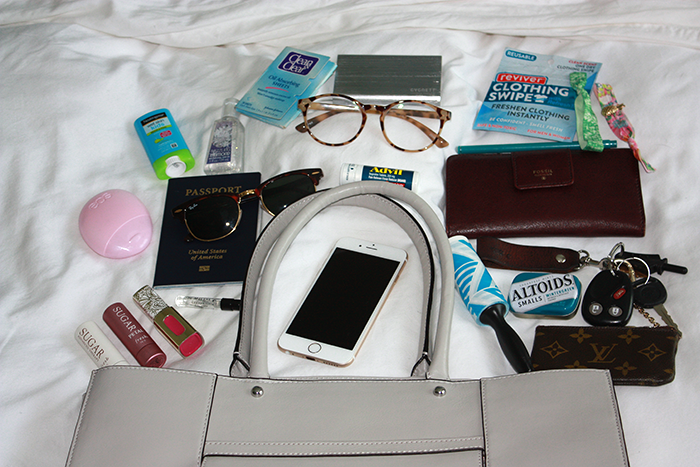 I absolutely love reading posts about what is in people's bags whether it's for vacation, their makeup bag, or purse. If I were a cat, curiosity would have killed me by now. As far as my bag goes, I carry a lot of stuff with me and my bag usually weighs a ton. Call me over prepared, but it's rare that I don't have something that I need. Lately I've been carrying my Madewell Transport Tote, (last seen here and here) which is unfortunately sold out in the color I have, but they've come out with a darker brown and still have the grey and black as well. Since it's been getting a lot of use lately with all our travel, I'm starting to carry my Rebecca Minkoff MAB tote that I scored in the Nordstrom Anniversary Sale. 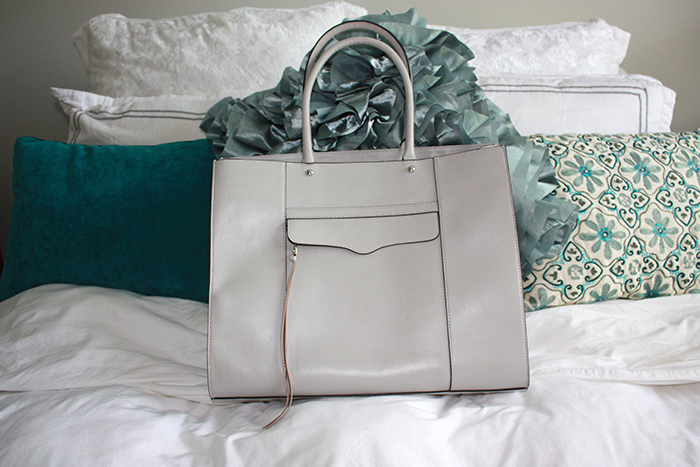 This bag is huge and really structured at the bottom. I love that in a handbag! Wallet(s) // I actually carry two wallets in my handbag. Call me crazy, but this system works for me. I carry my LV Key Pouch on my keys with my ID, most frequently used cards, and insurance card in it and a larger wallet, the Sydney Tab Clutch from Fossil. I do this so if I have to run out of the house quickly, all I have to do is grab my keys and I'm good to go. Chapstick/Lip Gloss // My favorite chapstick is Fresh. I've got it in the advanced lip therapy (no color) and Petal. I'm also loving L'Oreal Colour Riche lipgloss in fuchsia orchestra and dancing rose for my summer brights. Lotion // When I was working in the medical field, I found this lotion because it was easy to keep in a scrub pocket without being too bulky and I've kept using it for the same reason. It's not a miracle worker by any means, but it gets the job done! Perfume // I always carry a travel or sample size of my perfume with me, and my go to is Jo Malone Nectarine Blossom & Honey. Sunscreen // Neutrogena is my favorite sunscreen and I love that they have a small travel sized stick. When we were in Florida, this was a lifesaver and somehow went on my face without taking off my makeup. Sunnies & Eyeglasses // I alternate between my Clubmasters and my Wayfarers for sunnies and my glasses are from Zenni Optical. Mobile Charger // I never leave the house without this because you never know when you're going to be somewhere that you need your phone and it has somehow died. Food // I go from zero to hangry real quick. Our family has got to be the worst about this, so I always carry a bottle of water, a snack bar (usually Chewy, Luna, or Kind), and mints. Ponytail Holder // It's just way too hot outside to be without these. 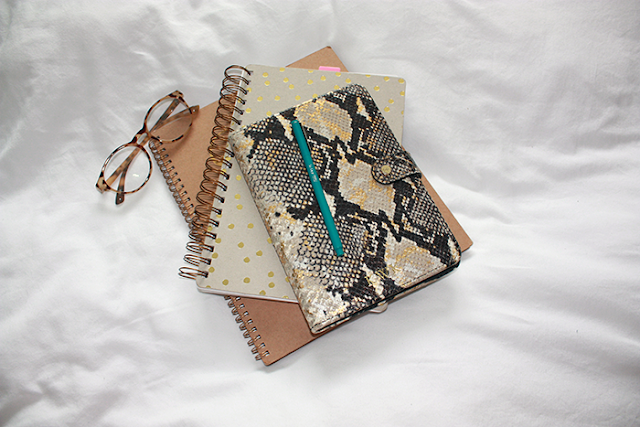 Notebook, Planner & iPad // Depending on where I'm going, I might throw all of these in. To me, I love writing things down on paper rather than using my phone. Passport // This one's new for me. Apparently Massachusetts places don't like to take Texas IDs! Lint Roller // I carry a mini one in my purse because there is nothing that Kyle and I own that is not graced by Pecan's hair. Seriously, the stuff is everywhere. Pain Reliever // You never know when a headache could hit you when you least expect or need one. Hand Sanitizer & Clothing Wipes // I hate not having a place to wash my hands, so the Bath & Body Works sanitizers are great. I also recently started carrying these Revive clothing wipes with me. I hate smelling like the restaurant I just ate in. Am I the only one like that? 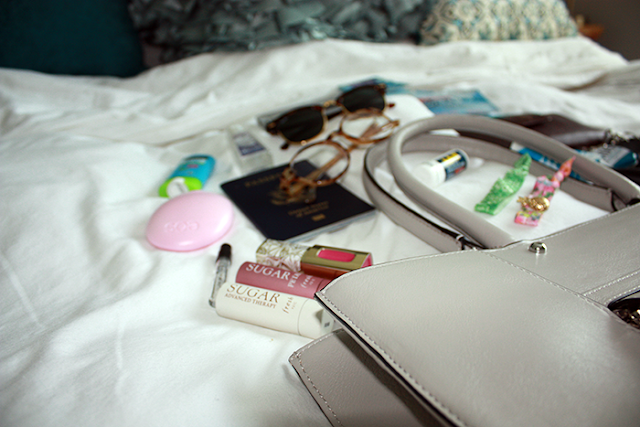 I hope you've enjoyed this little insight into my bag. I'd love to hear what you've got in your bags, and if you've done a post like this, link it below so I can be nosy!